Empire Contractors is offering clients in Grand Rapids, MI top commercial roofing services at low prices. We give out no-obligation estimates. From small repairs to whole roof replacements, Empire Contractors is the best company around. We recommend giving us a call at (231) 578-4760 when you find yourself in need of some roof help! The team at Empire Contractors is a great one to have behind you when it comes to the betterment of you roof. We can inspect your roof a couple of times per year which will help you save substantially over time. When you choose us as your go-to roof inspector, we’ll be able to keep repairs small and affordable and get more time out of your current roof. After we’ve given your commercial roof a thorough inspection, our team will know exactly the right type of repairs and maintenance it will take to get your roof back in solid condition. Our team is known for customized roofing plans that better suit our clients’ specific roofs. We’ll run through options with you and so that we can discuss them further. At Empire Contractors, we use the top roofing products on the market to restore all sorts of commercial roofs. 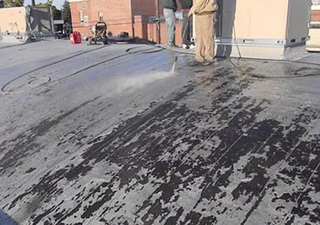 We can easily and affordably improve the condition of your commercial roof with a roof coating. Not only will this seamless layer help protect your roof from leaks and from aging, but it will also improve the energy-efficiency of your building. We promise to do our best to help you save money on your roof through repairs and restoration. However, sometimes there is no point in fighting against the inevitable need for a roof replacement. If your roof is not worth attempting to fix up, Empire Contractors is here to replace it at a reasonable price. We’ll set you up with a beautiful and long-lasting roof through our flawless installation. Empire Contractors has been around for quite some time now. We have gained some valuable experience and are now one of the most trusted commercial roofing companies around. 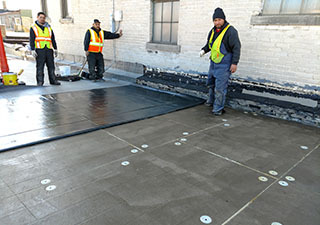 We provide high-grade commercial roofing services to clients in Grand Rapids, MI. You can reach us at (231) 578-4760 to set up a free onsite roof evaluation.